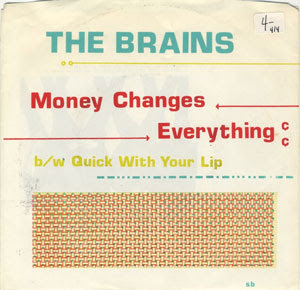 It only took 30 years and a lot of whining, but the original, indie single version of The Brains' brilliant debut "Money Changes Everything" finally found its way into my e-mail box this weekend. Many thanks to FD13NYC for not giving up and tracking this down for all of us. 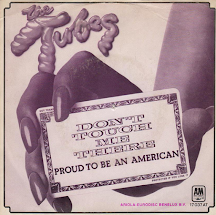 The differences between this version and the version that appeared on the band's major label debut for Mercury in 1980 may be subtle to most. But the first thing that strikes me as a drummer, is the weak mix and unnecessary reverb added to the album version. A crappy drum sound is really all I need to get turned off. You can find the crap version HERE. And the zip of the original version is HERE. Well about fricking time. Kudos and huzzahs to all concerned. And now if we can only find the amazing Bob Clearmountain remix of the Stones "Before Make Me Run," a vast improvement over the album version that was available briefly on a promo 45 and is now so obscure that Clearmountain -- when I asked him last year -- had no recollection of actually remixing. That's my Holy Grail, in case you were wondering. It's interesting your use of the word 'crap' today. BTW, nice find. Thx to FD13NYC. Was there a formal invite? I forget.